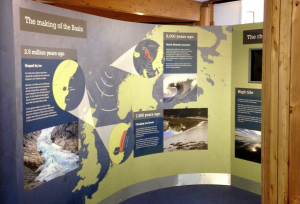 CMC was commissioned by Scottish Wildlife Trust to undertake the refurbishment of their flagship visitor centre at Montrose Basin on the east coast of Scotland. The centre has a fantastic viewing gallery which looks out over the basin and is the perfect spot for watching the great variety of wildlife that visits the site throughout the year. The core principal behind the refresh is to give the staff the key tools they need to help make the most of the centre and communicate with their visitors. From here they can learn all about the history of basin and the wildlife that can be seen in the area. CMC produced the concept design and managed the whole project and installation. We produced a suite of new graphics throughout to create a smart, clean, cohesive style that gives the centre its own identity whilst still being very much part of the Scottish Wildlife Trust. One of the key additions is a digital ‘wildlife portal’ that gives the Trust a place to store and display all of the amazing photographs that staff, visitors and volunteers have taken.